A lot of Chicago Bears fans are desperate to know. What’s wrong with Jordan Howard? It’s a fair question. Here’s a guy who ran for 1,000 yards or more in each of his first two seasons. Matt Nagy arrives with the first true modern offense the team has had in ages and instead of breaking out he’s in the midst of the worst season of his career. Through 12 games Howard has 612 yards, averaging just 3.4 per carry. Unless he averages 97 over the next four weeks, he’ll finish the year under 1,000 for the first time in his career. It’s worth mentioning that Howard has not rushed for more than 82 in a game at any point this season. So the odds aren’t in his favor. This brings back the original question. Why? What has led to such an unexpected turn of events? One that has many thinking Howard could be traded next year as the team begins a search for a replacement. Sure, part of the problem is his own struggles but the main culprit is the most obvious. The offensive line isn’t blocking well enough. Here’s some video to help explain why. The arrival of Nagy was supposed to upgrade the passing game. This he has done. The Bears are throwing the ball better than they have in years. As a result, defenses haven’t been able to load the box to stop Howard has they did the past few years. In 2017 he faced a box with eight defenders or more in it over 43% of his carries. This season that number dropped to less than 14%. So how is it that he’s not gashing defenses more often. It starts with a simple case of his blockers not getting enough push. Watch the play above. It’s first down. The defense has six defenders in the box. In these situations the offensive line should have the advantage as there is less for them to block, opening up chances for a double team somewhere. Yet at the snap, they fail to generate any sort of movement. Howard is bottled up for just a three-yard gain. The main culprit is center Cody Whitehair. He gets stood up almost right away, losing the leverage battle with the defensive tackle who’s able to keep him stationary until he locates where Howard is running. Then he sheds the block, clogs the lane and the gain is minimal. If Whitehair had moved him out of the way, Kyle Long was already at the second level and could’ve sprung him for a big play. Here’s another example from the Cardinals game that has been a persistent feature. One thing the offensive line does great in pass protection but can’t seem to figure out in run blocking is picking up blitzes. Way too often in several of there games, there was a linebacker or a defensive back who shot an open gap untouched, getting a free shot at Howard before he ever has a chance to get going. This is one of the ugliest examples. It’s 3rd and 1. The Bears have seven bodies on the line of scrimmage. So there should be no immediate penetration by the defense. Instead not one but two Arizona defenders are into the backfield a split second after the snap and have a clean shot at nailing Howard for a loss. Only his impressive power and their poor tackling prevented it. The replay shows Charles Leno failed to keep contain on the right edge, getting caught on a double block and allowing a blitzer to go untouched. The other was a poor read by left guard Eric Kush to find the other defender. He didn’t really block anybody at all. There there’s the matter of blockers showing poor technique. On this play against Detroit, the culprit is right guard Bryan Witzmann. Most of the play is actually blocked well. The left side prevents any penetration. It’s his job to be the kick out guy. That means hitting the gap and picking off the linebacker to leave Howard one-on-one with a defensive back. However, rather than finishing the block Witzmann merely collides with the linebacker and is actually driven back. Howard is thus forced to try cutting back to the left where it wasn’t designed to go and gets a minimal gain. If Witzmann had driven a guy he outweighed by 82 lbs back like he should’ve, Howard could’ve driven through the defensive back for at least four or five yards. 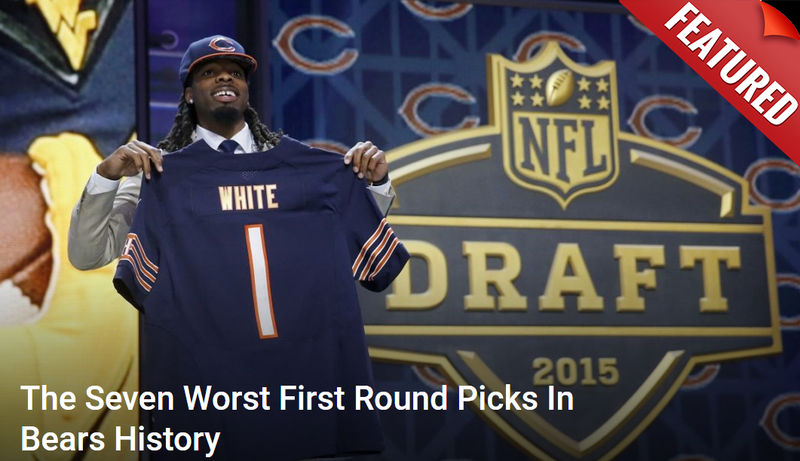 It’s little things like that which have stymied the Bears running game all year.